Ciaran Murtagh is named at corner forward. 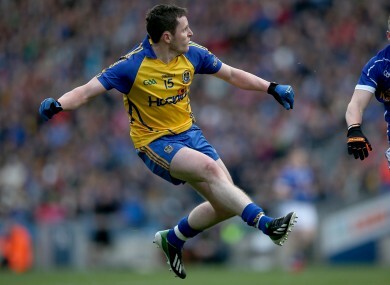 JOHN EVANS HAS handed championship debuts to three players for Roscommon’s Connacht quarter-final against Leitrim. Ciarán Cafferky, Ronan Stack and Ciaráin Murtagh, all members of the U21 team in 2012 who reached that year’s All-Ireland final, will make their first starts for the Rossies on Sunday. Overall there’s only one change from the side that defeated Cavan in the Allianz League Division Three Final with Ronan Stack coming into the side at left half forward for his St Brigid’s team mate Darragh Donnelly. Among those injured are U21′s Conor Daly and Fintan Kelly, last year’s wing back Paddy Brogan, Michael Finneran, Donal Keane, and 2006 All-Ireland minor winning captain David Flynn. There are none of this year’s U21′s panel included in the starting fifteen. Leitrim have also given championship debuts to Donal Wrynn, Damian Moran and Sean McWeeney. Throw in at Dr Hyde Park is 3pm on Sunday. Email “3 championship newcomers for both Roscommon and Leitrim”. Feedback on “3 championship newcomers for both Roscommon and Leitrim”.